When I set out to make this record, I imagined it being a solo thing, but not in the sense of one guy strumming an acoustic guitar and singing… Solo to me meant that I would do everything – write the songs, play all the instruments and sing. But Spencer’s been with me from the very beginning demo sessions, playing drums and helping the songs take shape. In that sense, the record is kind of like a solo album performed by a duo. One of the great virtues of being an artist is you have consolation… The family was involved in something together, and as Susie’s health transpired, [making the album] gave us a welcome sense of meaning, a sense that things were moving forward and there was something to look forward to besides more biopsies and scans. It just became comforting to everyone. 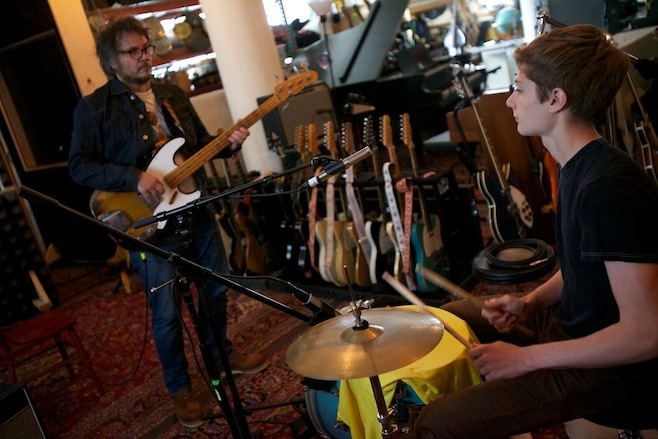 Even Tweedy’s younger son, Sam, contributed his comments and suggestions to the album, earning himself an Executive Producer credit. Overall, it sounds like Sukierae was the ultimate family bonding experience when they needed it most. Sukierae also features back-up vocal’s from Jess Wolfe and Holly Laeassig of Brooklyn’s own Lucius, and additional keys from Scott McCaughey of R.E.M. (which happens to have been one of my favorite groups since I was 12). Click here to check out my other Wilco-related posts.